This post is meant to inform those unable to attend the Dolan DNA Learning Center workshop at the Stowers Institute on Genes to Cognition. This is a site that you will want to delve into when you have a bit of time on your hands. Well, that is if you are interested in learning and teaching about the connect between genes, cognitive behaviors, and their related brain disorders. In all honesty, the site reminds me of Thomas Huxley’s book The Crayfish through which he demonstrates that the subject of zoology could be taught via a single model organism. In a similar manner, Genes to Cognition facilitates the teaching of biology at all levels of complexity, from the molecular communication networks of our cells to the behaviors that emerge from their collective actions. At the same time, students will realize that there are numerous unanswered scientific questions awaiting research. Having had little time to digest the material presented, I currently don’t know where I will integrate Genes to Cognition into my courses but “What good is a brain?” it is quite an appropriate question for students to ask and begin to explore. The site is presented from a perspective that, on one hand acknowledges the importance of the reductionist approach, while fostering the burgeoning systems based perspective. The site is divided into three sections including Disorders, Cognitive Processes, and Research Approaches. Like the DNAi website, it uses flash to provide a number of resources. There are texts, interactive animations, and one-on-one videos with important researchers in the field. Some of the animated interactive activities are experimental in nature. Once you choose a particular section on the website, there are two main means of navigation. One is the subway line navigation along the top (like bread crumbs) that follows a more chronological traditional story line through genes, biochemicals, cells, brain anatomy, cognition, and the environment. The other means of navigation is through a more open ended network (concept map) approach in the main window ot the screen. 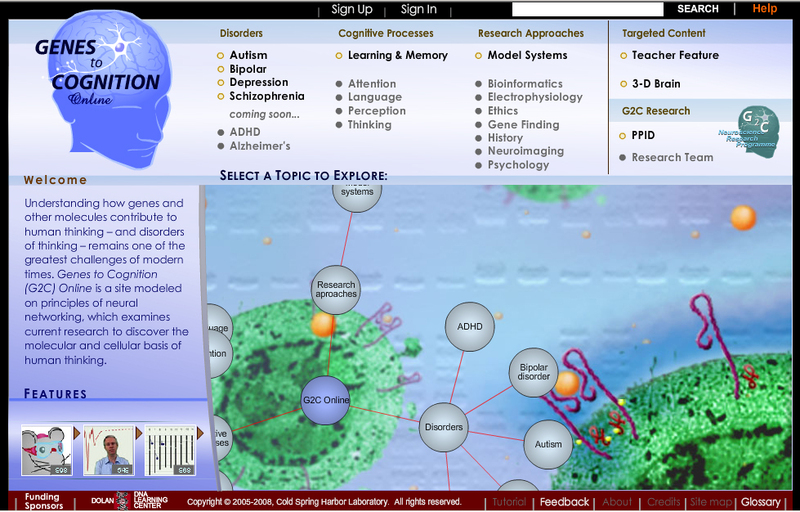 If you get lost you can always click on the Genes to Cognition icon in the upper lefthand corner to return to the home page. For a good example of their interactive experimental animations, click Sap102 and simulate the experiments on memory in swimming mice that have had the Sap102 gene knocked out, or click Fly School and try to train fruit flies to remember an association between a particular odor and shock. Interestingly, the site also incorporates links to external research websites like PubMed, NCBI, etc… so there is a seemless connection between the Genes to Cognition content and the world of active biological research. There is also a teacher feature area where one can access pdf files for lessons, and a 3D brain that helps with underlying brain anatomy. The site is still under construction and their target for full functionality is January 2008. If you don’t want to waste time navigating an unfinished site you can take a sneak peek of two resources through the home page of the Dolan DNA Learning Center. Below are resources that participants mentioned during the workshop. This is a TV Show that contains resources that connect, in a number of ways, to the Fly School activity on Model Organisms and Tim Tully’s research on the CREB gene. In fact, it contains a video segment where Dr. Tully describes his research with this gene. If you want to watch that segment, click here and then scroll down to find the Gene You Won’t Forget sement. As discussed, Dr. Tully has recently started a private company, Helicon Therapeutics, to develop and apply his finding to humans. I hope that you are already aware of this website. You can find more information about the Nobel Laureate Eric Kandel including an autobiography, CV, a video tape and text document of his Nobel Lecture, etc… If you have used any of the Nobel interactive activities or games, the Dolan DNA Learning Center has beat them to the punch in offering materials that allow one to explore Dr. Kandel’s novel research. Here is the link that was brought up regarding a 14 minute video on Mirror Neurons. The Project 2061 is their initiative to advance literacy in science, mathematics, and technology. One of their products is an Atlas of Maps (some online) that relate important concepts. This site provides a concept mapping tool that is described and can be downloaded for free. It is quite user friendly software that allows students to create concept maps similar to the one’s on the g2c website. In fact, the Dolan Center is currently creating their own mapping software that can be used in conjunction with the site. For example, it may keep track of a students particular navigation history of the site (this is already being done at the bottom of the screen)and potentially provide an intial list of appropriate concepts for them to map based on that history. Thus, providing a tool for formative assessment. Time, Love, and Memory: A Great Biologist and His Quest for the Origins of Behavior by Jonathan Weiner about the fruit fly, etc… research of Seymour Benzer. It is a wonderful read. In Search of Memory: The Emergence of a New Science of Mind by Eric Kandel. The book is more than an autobiography of Dr. Kandel’s research with Aplysia. It is a widow into the life of an individual, plagued by memories of the Nazi’s rise, whose motive and persistence has helped to discover the psychological basis for memory through experimental studies of small systems of neurons and their molecular components. Great post Eric and great resource…. Next Next post: Tagging Monarchs Tomorrow?